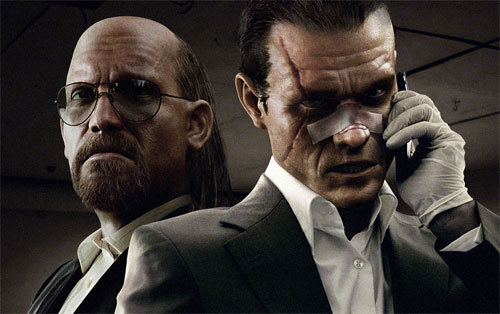 Kane and Lynch: Dead Men was a game that may or may not have gotten its fair shake due to a review scandal surrounding it. Despite that, it featured a gritty story with dark characters that were forced to make some difficult decisions. We already knew a sequel was in the works, and it looks like the information is finally starting to come to the surface. A surveillance like video has hit YouTube that shows what appears to be a naked Lynch running through a window and getting attacked by a dog, only to be saved by another naked man who presumably is Kane. Why naked? According to a Kotaku tipster the duo gets in a bit of a pickle before uh...almost receiving a pickle after getting ambushed. Needless to say they run for their lives. I have to say, the prospect of running from attack dogs, naked, with your friends in co-op is both hilarious and frightening. It's one of those cases where a music choice is going to set the mood. Benny Hill? Instant laughs. The original Kane and Lynch supported split screen co-op through the entire game, but we have hopes the new title will add in the much needed online support for the campaign co-op. Kane and Lynch to Get DLC? Page created in 0.8906 seconds.